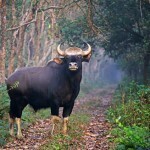 Places to see at Chilapata: Chilapata preserves wildlife in its core. The forest of Chilapata abounds in a jumble of birds and animals. Chilapata itself is a world of colorful and beautiful birds like fishing eagle, shikra, crested eagle, jungle fowl, peafowl, partridge, Bengal florican, paradise flycatcher, racket-tailed drongo and pied hornbill. The forest is never at ease due to the continuous fluttering of birds. Chilapata is a hub of wild animals. It crawls with different species of the Royal Bengal Tiger, the Asian rhino, elephant, leopard, sambar, hog deer, barking deer, wild pig, hispid hare and bison. Reptiles like python, krait, cobra, water monitor and freshwater turtles enrich the wildlife of Chilapata that is the most precious treasure of North Bengal. Chilapata boasts about not only its geographical importance but archaeological and historical importance as well. The “Nalraja Garh” or “Mendabari Fort” located near the Bania River is one of the chief lures of Chilapata. The ruins of the fort tell the history of the Nal kings. The construction of the fort traces back to the Gupta period, the Golden ear of Indian history in the 5th century. Nearby Attractions at Chilapata: Chilapata offers you a drink to the pure pleasures of nature in its every artifice. The surroundings of Chilapata hold an irresistible attraction with tourists. The places of tourists’ interest around the reserve forest are Neora Valley National Park, Mahananda Wild Life Sanctuary, Buxa Tiger Reserve, Gorumara National Park, Jaldapara Wild Life Sanctuary and Chapramari Wild Life Sanctuary. Things to do at Chilapata: Chilipata is a Wildlife Sanctuary and a National Park. It is a hub of wild animals. Nature walks in nearby forest, bird watching. How to reach Chilapata: Chilapata is a dense and deep forest in the Doors region of North Bengal. It is near Jaldapara. Chiltapata is only 20 kilometers from the town of Alipurduar in the district of Jalpaiguri. Chilapata is not easily accessible from all parts of Jalpaigudi except from Alipurdaur. There is car or jeep service available from the town of Alipurduar to Chilapata. Best time to visit Chilapata: Many of North Bengal areas remains in beautiful atmospheric condition from the month of September to the month of February. Therefore, this time is the most suitable to visit Chilapata. Lodging & Dining facilities at Chilapata: Resort, lodges and private accommodations are available here. The resort offers accommodation with basic facilities to its guests. It takes a few minutes to reach Kodalbasti from the town of Hasimara. I want to book a vacation at Chilapata during the puja vacation of 2011. What should i do? Can you help me do the bookings? Please use the link “BOOK YOUR TRIP TO CHILAPATA” and drop in your enquiry. Our travel desk would take up from there and answer your queries and help you in the booking.